In 2016, Cole Pauls released Dakwäkãda Warriors, a language revival comic that stars two Native power rangers, Wolf and Raven, as they fight against an evil pioneer and a cyborg Sasquatch. 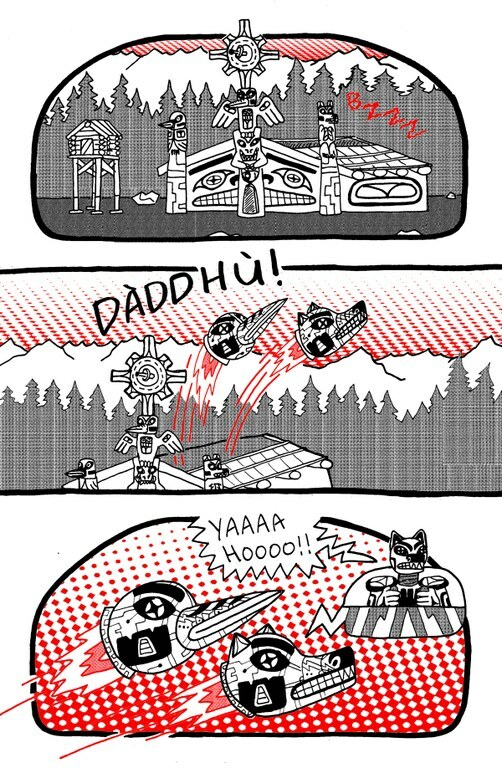 It was a one-off comic based on the Northwest Coast legend Raven Steals the Sun, but in Pauls’ imagining, Raven still has the sun and protects it. In his version the comic’s villains, Cyber Nà’į and Space Kwäday Dän, attempt to steal the sun in order to thaw frozen wooly mammoths on one of Jupiter’s moons and use them to attack the earth. According to Pauls, reception was so good he continued on, releasing Dakwäkãda Warriors III this year. A Tahltan First Nation comic artist, illustrator and printmaker from the Yukon Territory, Pauls holds a BFA in Illustration from Emily Carr University and focuses on his comic series: Dakwäkãda Warriors, Pizza Punks and Astral Projection Comix. High Country News spoke with Pauls about his work and how comics and Indigenous storytelling traditions can work together. This interview has been edited for clarity and length. High Country News: Do you see a lot of people retelling traditional stories in Indigenous comics? Cole Pauls: I would say there’s not a lot of us doing that. I feel like a lot of legends and First Nations stories are protected – they’re stories that have been told for generations and then we weren’t allowed to share them. So stories involving old legends, I feel like people try to stay really true to what an elder said because their voice is really precious, so I haven’t seen a lot of people doing a retelling of an Indigenous story, but I’m definitely not the only one. There have got to be others. 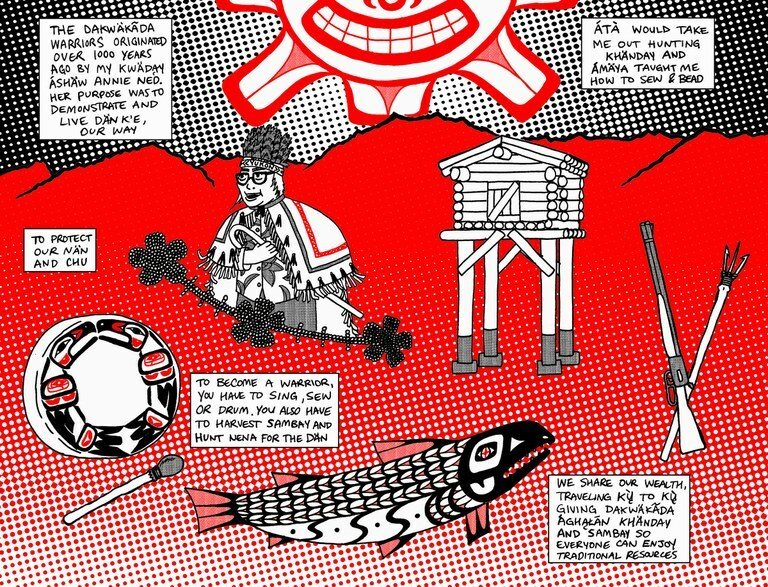 Like the Moonshot Indigenous Comics Collection, have you ever seen that one before? CP: AH Comics, they did two volumes and they just started their Kickstarter for volume 3, but those anthologies have some stories that are traditional Native folklore, and I think some of them are riffing and retelling comic versions. HCN: Do you think there’s any sort of danger to that at all? Knowing a lot of Kiowa stories, for instance, I think a lot of them are very exciting, a lot of them are really funny, and there are themes and ideas that translate really well, but do you think there’s a risk to reimagining those stories? CP: I think it’s important to establish where you’re coming from when you're doing something like that. Someone who doesn’t know the story may not realize what you’ve included versus what was in the original story, you know? I do think it’s important to show your roots and tell people where you're coming from. HCN: Would you say that your audience is primarily an Indigenous audience? HCN: Have you seen that response? CP: Yeah, I have. It was really cool. When I finished the first issue, one of my translators, Vivian Smith, she’s an elder that taught me Southern Tutchone from kindergarten to grade 12. I went to my original school, and I went there just to drop off copies of my book, and I happened to have eight copies on me, and I went into her class and I was like, “Oh hi, Vivian. Here's your book,” and then she was like, “Where are you going? You should sit down.” And I was like, “OK.” And then she just turned around and was like “OK kids. Everyone grab a book, and we’re going to read this out loud together.” So it was kind of like an impromptu lesson for the kids and me because I just happened to be there to drop off the comics, and then Vivian was like, “Nope, you're going to help teach a lesson.” There just happened to be eight kids in the class, so I brought just enough for all the kids to read, and we read it all, and every time we got to a Southern Tutchone word we would ask the kids if they knew what it meant, and the kids got it right away, and they were just so happy to get something that wasn’t so text heavy, you know? It was a comic book. It was nice because it wasn’t planned at all. It happened organically, and I left the class feeling like I was walking on the right path, and that it was a good decision to make a book like this. HCN: Are you seeing a change when it comes to Indigenous representations in comics, zines and other graphic forms? HCN: From where I’m sitting, there seems to be a renaissance or resurgence going on in Indigenous comics, but I can’t tell if that’s my limited understanding of the scene or if there’s an actual mushrooming in Indigenous comic makers. How do you explain what's going on? CP: I would definitely say it’s growing. I put up Instagram posts and tag them #IndigenousComics, and if you look that up, the list is getting bigger now. Every year or so I end up posting something and hashtagging it, and that picture of all the comics gets bigger and bigger. I just think it comes from educating other First Nations people and non-Native people about your clan or your tribe. There’s just a lot of misinformation, and I think someone who has the right information has the ability to share it now and more easily than ever. I think it’s kind of becoming a snowball effect where people say, “Wow, that’s really cool and really important” and then a second artist thinks that and then they do it, and then another artist does it. HCN: Are you saying that the explosion of Indigenous comics is partly the number of people who want to do it, as well as having access to getting work out there? CP: Yeah, for sure. 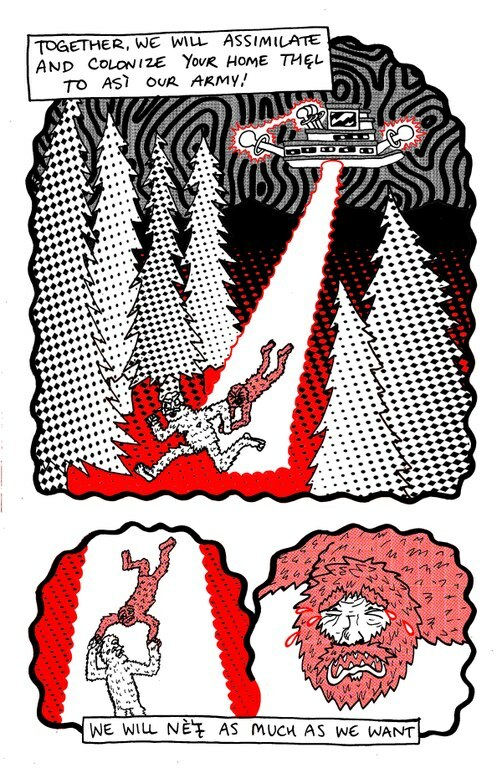 The artists I mentioned before, like Gord Hill, has been making zines for a really long time. I went to a zine fair and there was a mobile zine library there, and they had a zine by him from ’96, and it was all formline. It was all about residential schools, and it was super-intense and printed black and white. Stuff like that you have easier access to now, and if you have an interest, I think you can just Google it now and hopefully find what you’re looking for. HCN: In terms of zines, the history is really fascinating since they draw from influences like 16th century Chapbooks, sci-fi fan zines of the 1920s and moving up to 80s Riot Grrrl movement, but do you think of zines and Indigenous comics coming from a different tradition than what we see in zine-making culture? CP: I think so. A lot of our culture and who we are comes from an oral tradition, and it's only been in the last 100 years that we’ve written down these stories or talked about these legends on paper. I think our kind of storytelling and how we share our culture kind of goes hand-in-hand with zine culture. It’s a good pairing. I would say that it’s different, it comes from a different way of sharing knowledge and educating people, but I think it’s just as an appropriate way to share knowledge in a book as an elder telling you. HCN: I think of ledger drawings that originated in the mid-to-late-1800s and I think of my tribe and the ledger drawings we did. When you see them, you realize they’re telling a story visually and oftentimes in sequence and could be considered a comic book on some level. I think while people see graphic novels like Maus as groundbreaking storytelling, I think an argument could be made that Indigenous people have pioneered that. CP: Yeah, I totally agree. A totem pole can tell a whole family story and same with a button blanket. It can explain someone’s entire clan. Masks too. A lot of masks can tell specific legends, and a lot of masks are only worn when they’re performed with certain songs because they’re half the story. That mask is telling half the story, not just the singing. Comics are storytelling and so is singing and so is a huge longhouse mural – it’s portraying a story. HCN: What are your thoughts on continuing to use those traditional forms? CP: I feel like traditional art has this weird – I don’t want to say protection – but I think people aren’t critical enough with traditional art. I don’t think they really analyze it as they would a Renaissance painting. I think it’s important to talk about that. HCN: When you say analyze or be critical, do you mean in terms of talking about quality and content with the same type of language that we might use when discussing non-Indigenous art? CP: That’s exactly what I’m talking about. Not enough people will look at an illustration of a thunderbird and talk about how something’s missing out of it, or that the shape is off. I think a lot of people look at First Nation’s art on a really high pedestal so when they see something they’re just like, “That’s beautiful.” But you don't say that about every painting. You kind of have to explain why you think that painting or the thunderbird are beautiful. HCN: I agree, I think it’s important to be able to talk about what it is you like about a piece, even if it’s just the feeling it gives you. I mentioned ledger art, and I see a lot of contemporary ledger art out there that drives me nuts because it’s just bad. CP: It can be generic, unoriginal and bland. In my friend circle, if you bring up an artist and you're talking to a carver, they’ll straight up be like “That guy’s form line is so lazy,” or like, “He’s so unoriginal. He does the same four animals and that’s all he does.” And I feel like a lot of those conversations are kept in the studio and aren’t shared with the public. HCN: Do you see those decisions driven by a desire to continue that particular practice or do you think a lot of that’s driven by non-Indigenous consumption of that art? CP: For sure, I have some relatives that fall under that category. They do a wolf, they do a crow, they do a killer whale and they do a frog and an eagle or something like that. They do five animals and they’ll make a bracelet with it, they’ll make a ring with it, and that’s all they do, and it’s like they’re trapped inside this box of catering to non-Indigenous people for money. They’re making art for a client, not necessarily for themselves. HCN: Would you say that’s always a bad thing? CP: I think it’s important to respect the Native carving heroes and the pioneers who really kept making traditional art and kept culture and tradition alive. That is important. But it’s another thing to just do that to guarantee yourself a sale. HCN: I agree. I like seeing artists continue to challenge themselves and innovate. CP: It’s called playing it safe. That’s the nicest way to describe it.